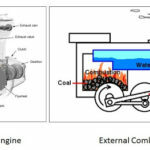 We often talk about the power output when it comes to internal combustion engine, from over a century various research have been conducted to study and to modify the factors affecting the power output of an IC engine, the configuration of the engine like CC, is decided after these various research. Now let’s just ponder, Are there any effects of cylinder size on the engine’s power output? What effects do the engine configuration like cubic capacity made on engine’s output? A compression ratio (CR) of an I C engine is the ratio of the total volume of the combustion chamber To the volume left after complete compression i.e. clearance volume. 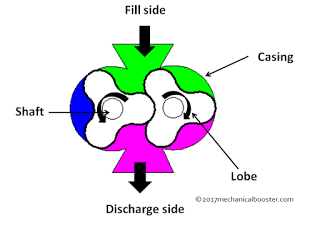 In simple words it is the ratio between the total volume of the combustion chamber which is left when the piston is at its bottom dead center and the volume left inside the combustion chamber when the piston moves to its top dead center. For example- Let’s consider an engine having 1000cc total volume out of which 900cc is the swept volume i.e. 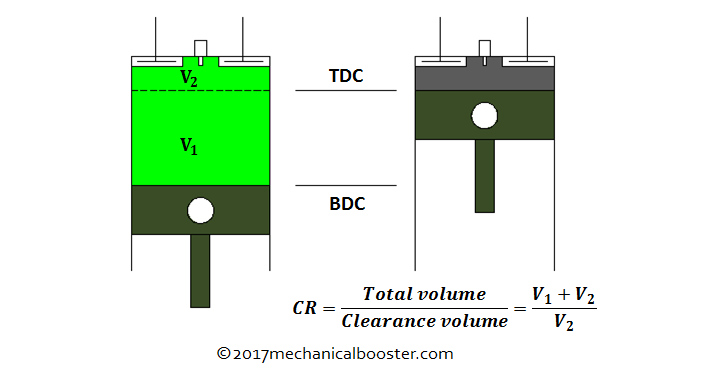 the volume covered by the piston when it moves from BDC to TDC, and having 100cc clearance volume i.e. the volume left inside the cylinder when the piston reached to its TDC. So the compression ratio of this engine will be 1000:100 or 10:1. It is found that greater the compression ratio more will be the power output of the engine. 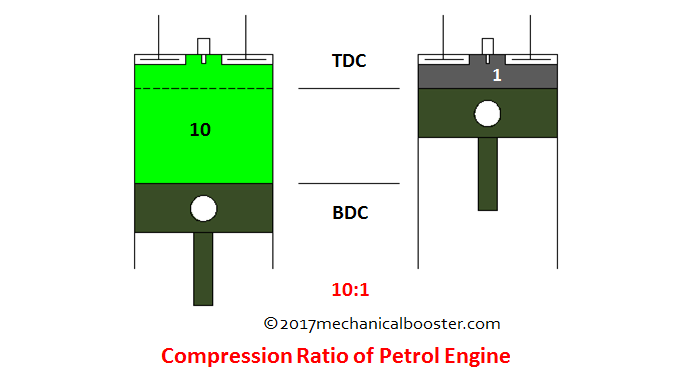 The compression ratio of diesel engine is much higher than that of petrol engine. i.e. for petrol engine the CR varies from 10:1 to 14:1 and for diesel engines the CR varies from 18:1 to 23:1. What is the Need of Compression Ratio? 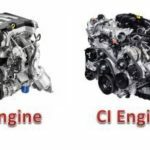 The compression ratio (CR) of an I C engine is a design criterion that has to be determined by the design team while designing the engine; the CR is selected according to the output need of the engine as it directly affects the engine output and also the overall size of the engine. 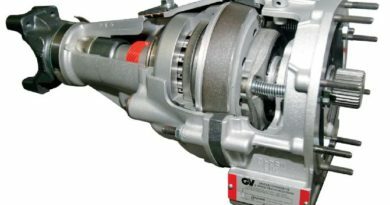 As we all know the in petrol engine air-fuel mixture enters the combustion chamber during the suction stroke and for proper mixing and for proper combustion of this air-fuel mixture compression of this mixture is required which is done by the engine in its compression stroke, so a good compression ratio of the petrol engine is required for proper combustion of the air-fuel mixture which in turn provides better thermal efficiency. The pressure inside the cylinder increases during compression stroke which in turn raises the temperature of the air-fuel mixture that leads to a complete or proper combustion of the fuel when the spark plug produces spark which in turn provide better fuel economy and also prevents the engine from various defects like knocking. 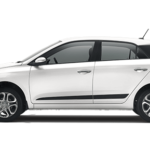 The petrol engine with proper CR provides a balanced amount of power and speed. The petrol engine usually comes with 10:1 to 14:1 compression ratio depending upon the application and design requirement. 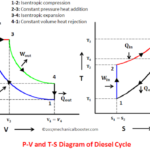 In diesel engine a high CR is required as the diesel engine doesn’t have any spark plug so the combustion of the fuel completely depends upon the compression of the air provided by the compression stroke of the diesel cycle because of which diesel engine is also known as compression ignition engine. The diesel engine with high compression ratio provides the engine with high compression i.e. provides high pressure rise, which is required to increase the temperature of the compressing air to the extent of the auto ignition temperature of the fuel that is to be sprayed by the fuel injectors which in turn provide complete or proper combustion of fuel. The diesel engines are known for providing high power output which is due to the high compression ratio of the diesel engine, as we know higher the CR higher will be the thermal efficiency or work output. A diesel engine with high CR provides high fuel economy due to the higher thermal efficiency provided by the high compression combustion. 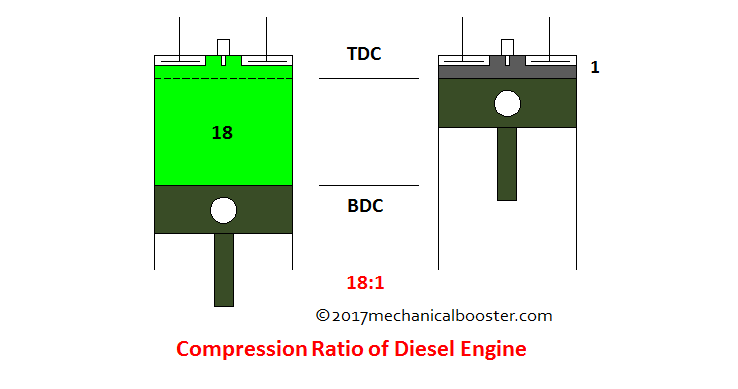 Diesel engines usually come with higher compression ratios varies from 18:1 to 23:1 depending upon the application and the design requirement. 1. 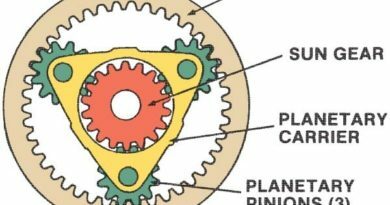 Stroke length – The stroke length of an engine is the length of the combustion chamber or the distance between the TDC and BDC of an engine cylinder, the compression ratio depends on the stroke length, as higher the stroke length of the engine cylinder higher will be its CR. 2. Bore diameter – The shape of an engine cylinder is cylindrical so the bore diameter of an engine is the diameter or inner diameter of the engine’s cylinder inside which the piston is moving, The compression ratio of an engine depends upon the bore diameter as higher the bore diameter of an engine higher will be the compression ratio. 3. Square engine – These are the type of engines in which the stroke length of the cylinder is made equal to the bore diameter of the engine’s cylinder which gives a proper balanced power and speed output. Note – Practically no engine is a square engine in this world but the engines of the formula 1 are made approximately square. 4. Number of cylinders – Number of cylinders also affects the CR of an engine as the engine with higher number of pistons provides higher compression ratios. So it can be concluded from the above design criteria that the engines that are bigger in size has high compression ratio than the engines that are small. Due to this bigger size requirement of the in-line engines with the high CR, V-shape engines are introduced that provides high compression ratio with compact size of the engine. 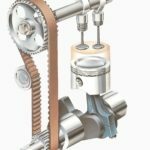 In this article we have learnt about what is compression ratio and how it affects the power of an engine. We have also discussed the factors on which the CR depends. If you like this information than don’t forget to like and share it on social media like Facebook, Google+ and so on.